The Petra Foundation was established to sustain the trajectory of Petra Tölle Shattuck’s life by honoring the people she most admired—unsung local heroes who are fighting injustices and working to make the world more equitable and just. Over 25 years the Petra Foundation—an all-volunteer, publicly supported 501(c)(3)—built a national network of leaders, working across the divides of age, ethnicity, class and issue to build a more just society. 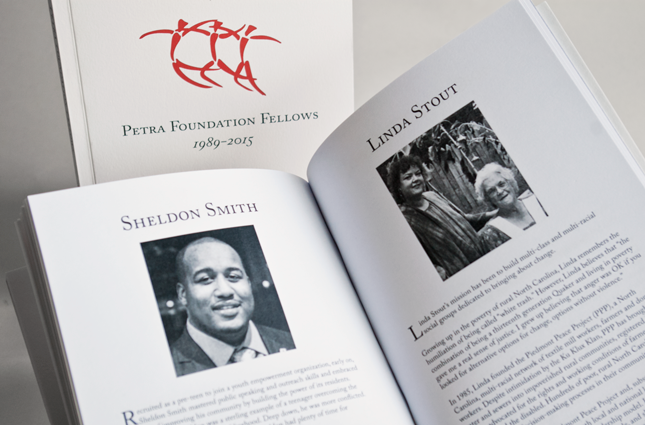 There are 100 courageous, inspiring Petra Fellows. In 2015, when the Petra Foundation celebrated its 25th anniversary, it ceased operations and forged a partnership with the Center for Community Change, a dynamic movement-building organization with diverse leadership, focused on systemic change, national in scope but deeply grounded in grassroots communities. Petra Shattuck saw others as but one voice in a chorus of those willing to stand up against injustice. By forging the links between Petra Fellows and other leaders at the Center for Community Change, the chorus gets louder, the force against injustice gets stronger, the movement grows.